The Atmospheric Radiation Measurement Program’seducational outreach is involved in climate change outreach in the communities and regions hosting ARM's data-gathering field sites. The goal of the education and outreach program is to develop basic science awareness and increase critical thinking skills focusing on environmental science and climate change for K-12 students. In addition, the program supports relationship building between teachers, students, scientists, and the community. This web site houses a reviewed collection of K-20 educational resources meant to help students’ understand the core ideas in climate and energy science. These resources have been linked to the essential climate and energy literacy principles and are searchable in a variety of ways. Eco-Schools USA is a holistic program. It strives to make environmental awareness and action an intrinsic part of the life and culture of a school, including students, teachers, administrative staff, non-teaching staff and parents, as well as the local community. This curriculum houses 21 lessons that look at utilizing NASA’s Earth Observing Satellites to better understand Earth’s complex systems and how climate change effects those systems. Learn more about how to address climate change at your school. This competition provides practical strategies to reduce carbon dioxide and other greenhouse gas emissions school-wide. These webcasts focused on how climate change is affected the tundra and its wildlife. Teach your students the importance of green energy while enhancing your required curriculum. Lesson plans can be searched by grade level and topic and are correlated to national science education standards. There are creative lesson plans, labs, projects and other activities for grades K-12 on energy-related topics. Incorporate them into your classroom. Prepare your students for a greener future! Learning about energy is fun when you include Energy Hogs! The Energy Hog Challenge is a set of classroom activities that guide children through lessons about different sources of energy, how we use energy at home, and how to bust energy hogs to save energy. Our teacher guide provides energy lessons that use this website as a resource. The guide provides language arts, math, performing arts, science and social studies extension activities by age levels: primary, elementary, intermediate, and secondary.  ENERGY Guide to Energy Efficiency Competitions for Buildings and Plants, http://www.energystar.gov/buildings/tools-and-resources/energy-efficiency-competition-guide . Learn the benefits of hosting a competition and strategies to help you launch a successful competition in your school or school district.  ENERGY STAR Parent and Teacher resources, www.energystar.gov/kids: Click on the Parents and Teachers tab for lesson plans and more games and activities. This is another organization that has resources and activities for students and also has free kits teachers can order to teach about energy topics. The Green Education Foundation is a non-profit organization that provides curriculum and resources to K-12 students and teachers worldwide with the goal of challenging youth to think holistically and critically about global environmental, social, and economic concerns and solutions. They have K-12 Lesson Clearinghouse as well as a variety of challenges which students can participate in related to environmental education. NEED designs and delivers curriculum and support for virtually any classroom and at any grade level – from kindergarten to high school and beyond – from science and pre-engineering labs to language arts and afterschool clubs. Students use hands-on, inquiry based lessons to explore the physics and chemistry of energy. They engineer turbines and generators, testing their models for maximum electricity output. Students write and perform plays about energy in drama class, calculate payback periods of energy efficient appliances in math class, and discuss the history and human impact of energy use in social studies. Cool The Earth is a free, ready-to-run climate change assembly program that educates K-8 students and their families about climate change and inspires them to take simple actions to reduce their carbon emissions. The program is successful because it’s fun and empowering for the kids, and their enthusiasm is contagious! Foster an appreciation of the environment and an interest in the green space in your community with these classroom resources designed for students in grades K-5, recently updated with NEW lesson plans and activities for K-2! With TurfMutt as your guide, your class will get outside, investigate the benefits of landscaping and recycling, plus understand the importance of the lawns, flowers, bushes and trees that surround us every day. A Who’s Guide to Saving Our Plant for Who’s of All Shapes and Sizes! This is a 6-page activity book uses Dr. Suess’ Horton Hears a Who! to learn the basics of climate change. The Lorax is proud to speak for the earth. Without it, what would our future be worth? And to the Once-lers among us offer resistance. Join EPA in spreading the word. Then finally the voice of the earth will be heard. The lesson plans and information are designed for educators of grades 3-6 with adaptations for additional grades. Students of all ages, who love wildlife and want to learn more about these amazing animals, will enjoy it too. Our hope is that all will better understand the effects of climate change on wildlife habitat and become inspired to take actions to reduce carbon pollution. Climate Generation offers a suite of Grades 3-12 curriculum resources in the form of curriculum guides, as well as online modules that can be downloaded for free. These five lesson plans are interdisciplinary in nature, standards-based, help students master the requisite background information on global climate change processes and how to communicate about the issue using communication strategies. This set of lesson plans explores Minnesota’s unique biomes and what a changing climate will mean for the state. It is considered a model for place-based climate change education. Coal is our most abundant fossil fuel. The United States has more coal than the rest of the world has oil. There is still enough coal underground in this country to provide energy for the next 200 to 300 years. But coal is not a perfect fuel. New technology is making it cleaner. People of all ages are entranced by polar bears’ beauty, playfulness, and strength. And for good reason, they have become the iconic symbol of the troubled Arctic ecosystem. Find unit and lesson plans on climate, the Arctic ecosystem, and more. Here are three activities to teach about the carbon cycle. Educators can work with students to calculate their impact using a climate change calculator. EPA's Global Warming Wheel Card is a hand-held tool that you can use to estimate your household's emissions of carbon dioxide and learn how you can reduce them. One side of the wheel illustrates how much carbon dioxide a household contributes to the atmosphere per year through activities such as driving a car, using energy in the home, and disposing of waste. The other side shows how changes in behavior (such as buying a more fuel-efficient car) can reduce your emissions. 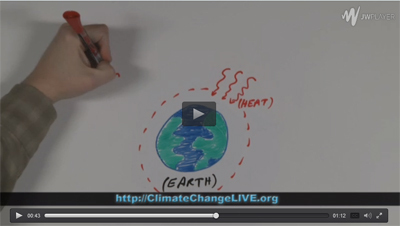 The complete Global Warming Wheel Card Classroom Activity Kit has eight components. Instructions for making the wheel are included. The Natural Inquirer is a middle school science education journal with lesson plans, articles, and biographies of scientists. In this edition of the Natural Inquirer you will learn about the effect that climate change may have on animals, plants, and forests. You will also learn how scientists are studying climate change. EPA has compiled a suite of hands-on, interactive lesson plans to complement and make use of the material at the web site, A Student's Guide to Global Climate Change (http://epa.gov/climatechange/kids/index.html). The plans work systematically and individually to reinforce students’ knowledge of climate change, as well as enhance skills across multiple disciplines. The lessons are correlated to national science standards. In the Arctic community we see different members with diverse perspectives and ways of knowing all contributing to knowledge and action to slow climate change. The lessons of community learned by studying the Arctic can inspire and empower all of us in our roles as community members on Planet Earth. The focus is on solutions and positive messages of hope and action. The 12 activities in this guide are designed primarily for students in grades 7 to 12. The guide contains activities applicable to a variety of subjects including sciences, math, language arts, social studies, and art. Each activity is designed to stand alone as an individual lesson, however, the more activities students complete, the better they will understand the many aspects of climate change. The lessons featured on this page provide a few possible ideas for climate change related studies using MY NASA DATA. More climate change related lessons and ideas are welcome. Find inquiry-focused classroom activities developed by the Ice Drilling Program Office. These six interdisciplinary lesson plans help students master the requisite background information on global climate change processes, the importance of the Arctic to global climate, the potential effects of global warming in the Arctic, and to consider what could/should be done in response. The Alliance for Climate Education's mission is to educate young people on the science of climate change and empower them to take action. First, we teach climate science that puts teenagers at the center of the story. Our live, in-school assembly is award-winning and proven to work. Second, we give every student a chance to take action. For some, it’s a small lifestyle change. For others, it’s hands-on preparation for a lifetime of leadership. The resources on this web page were developed to improve Climate Literacy and to provide access to scientific information, which can inform personal decisions about actions that influence climate. Citizen Climate is for high school students and focuses on global climate solutions. This curriculum emphasizes civic engagement and helps teachers and students understand the critical and complex climate solutions being discussed on the national and international stage, including equity in climate change international negotiations. Check out the climate change lesson plans, fact sheets, case studies, links and “Teaching Climate” resources.